The government of Equatorial Guinea launched the first phase of a campaign to immunize the nation’s children against polio last week. The government has been working closely with World Health Organization (WHO), UNICEF, United Nations (UN), Center for Disease Control and Prevention (CDC) Atlanta, the Bill & Melinda Gates Foundation and others to implement this proactive campaign. Leo Heileman, UN Resident Coordinator, has stressed the importance of the campaign and noted that all UN agencies are supporting it. “The WHO and UNICEF have mobilized technical support in order to have experienced consultants to accompany the national teams, and execute the planned activities to carry out quality vaccination campaigns,” he said. The government of Equatorial Guinea launched information campaigns to educate citizens about the need to take preventive measures against polio prior to the launch of the first phase, following a recommendation from the World Health Organization (WHO). During the informational campaigns and launch ceremony of the first phase, President Obiang Nguema Mbasogo stressed the importance of the vaccine and encouraged all parents to vaccinate their children under fifteen years old. Government officials, delegates, chairpersons of village councils and neighborhood communities were at the ceremony aimed at sharing this message with all parents, in order to complete the eradication of the disease in the Republic of Equatorial Guinea. A second phase will take place from May 23 to 26 and a third from June 10 to 13, sponsored by the government. President Obiang Nguema Mbasogo of Equatorial Guinea attended the canonization of Pope John XXIII and Pope John Paul II in the Vatican last week and met with Pope Francis. The President of Equatorial Guinea was one of the 24 heads of state, who attended the canonization, along with prime ministers and other senior representatives of countries and international institutions. There were more than ninety official delegations. He was accompanied by Constancia Mangue de Obiang, the First Lady of Equatorial Guinea. Approximately one million people attended the ceremony. Last year, President Obiang met with Pope Francis at the Vatican and exchanged with Vatican officials the instruments of ratification of an agreement with the Holy See on relations between the Catholic Church and the Republic of Equatorial Guinea. The agreement confirmed the good bilateral relations between the two states, recognized the legal personality of the church and its institutions, and covered canonical marriage, places of worship, educational institutions, and spiritual assistance to the Catholic faithful in hospitals and prisons. The government of Equatorial Guinea has developed a national climate change plan aimed at reducing carbon emissions and mitigating climate change. Equatorial Guinea is undertaking many initiatives to address climate change in the country. The Ministry of Fisheries and Environment and the Ministry of Mines, Industry and Energy are working together on a sustainable energy project that focuses on solar, wind and marine energy. This project is being implemented as a result of the national climate change adaptation plan. In addition, the climate change regulatory law in Equatorial Guinea has established the National Fund for Climate Change (FONAMA), which undertakes initiatives to improve the environment, such as conserving biodiversity and protecting migratory species. Engonga sees the recently approved aid to the Fund for Climate Change in Africa (FCCA) as a positive milestone for the African continent, which has not received significant financial aid to combat climate change and its effects. “This fund will help ease the access of countries to the financing they need to protect their economies and environmental assets in view of climate change,” said Alex Rugamba, President of the Coordination Committee of Climate Change of the African Development Bank. President Obiang Nguema Mbasogo called for the African, Caribbean and Pacific Group of nations (ACP) to strengthen cooperation to face energy problems, climate change and challenges delivered from globalization together at the 7th ACP Summit held in Malabo in 2012. Ambassador calls for stronger African participation in global organizations. The government of Equatorial Guinea has been a leader in the African continent and has established successful reforms and programs in the country, and its neighbors are doing the same, Ambassador Anatolio Ndong Mba, permanent representative of Equatorial Guinea to the United Nations, told attendees at a panel on “African Solutions, African Problems,” held at the Peace Islands Institute in partnership with the Journalists and Writers Foundation. Ambassador Ndong Mba discussed the Africa paradigm and said it is important that Africa and its 54 countries be regarded as equal partners on the world stage. Africa will be exerting its influence for a more fair and equitable benefit from its natural resources. Africa seeks an even greater economic diversification; this means that while Africa extends the value it receives from her natural resources, at the same time, there is a movement to increase diversification into other sectors for greater national and continental resiliency, making the continent less susceptible to oil shocks and volatility in the world commodity markets. As Africa continues to make significant progress in the political, social and economic spheres, the continent demands an even greater role on the world stage. 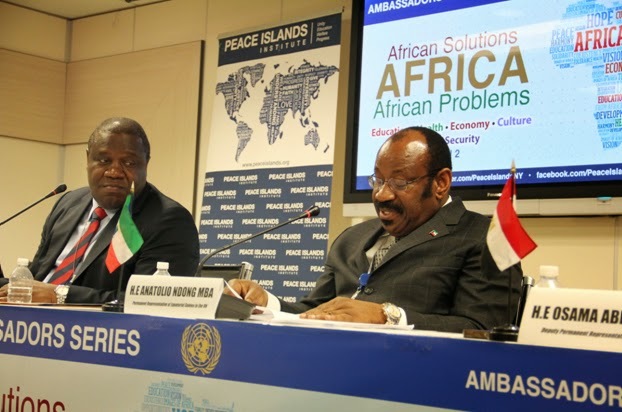 Ambassador Ndong Mba said that Africa welcomes partnerships but Africans must lead Africa’s development, and African solutions must be applied to African problems. During the panel, Ambassador Ndong Mba discussed Africa’s growing influence on the global stage and the growing number of countries on the continent that are embarking on policies of diversification and infrastructural development to attract investors and build a solid foundation for development. This trend is seen clearly in the rapid development of Equatorial Guinea over the last several years. “In my country, Equatorial Guinea, the President of the Republic set in motion a long-term development plan, Horizon 2020, which aims to invest in important sectors, which will in turn strengthen economic growth to ensure a transparent social climate, build important infrastructure to support a modern nation state, and improve social welfare and reduce poverty. A billion dollars have been set aside to support this initiative,” he said. Ambassador Ndong Mba said that Africa’s growing economic power should be met with growing political power on the world stage. The institute’s Ambassadors Series panel on African Solutions to African Problems covered education, health, economy, culture and peace and security and served as a platform to bring diplomats accredited to the United Nations together with academics, experts and civil society to engage with one another, and to discuss global issues and exchange multiple perspectives. The panel was moderated by H.E Antonio Tete, Permanent Observer of the African Union to the United Nations, and featured presentations by Ambassador Kingsley Mamabolo, permanent representative of South Africa to the UN, and Ambassador Osama Abdelkhalek, deputy permanent representative of the Republic of Egypt to the UN, in addition to Ambassador Ndong Mba. The Secretary of State for Public Health in Equatorial Guinea, Práxedes Rabat Macambo, led an informational meeting from the country’s continental region (also known as Rio Muni or Mbini) to brief healthcare providers on the polio immunization campaign that will be launched next week. The campaign is aimed at vaccinating the nation’s children against polio following two recent outbreaks. The purpose of the meeting was to provide information to hospital managers, health centers managers and vaccination program leaders about the three phases of the polio preventive campaign the Ministry of Health and Social Welfare will lead on April 21. Next week, the first phase of the preventive campaign, sponsored by the government of Equatorial Guinea, WHO, UNICEF and others, will treat children up to fifteen years old. A second phase will take place next month and a third in June. Last month, the government created a crisis committee to search for immediate solutions to prevent the spread of polio infection in Equatorial Guinea. The result was the upcoming immunization campaign. The government of Equatorial Guinea has launched a campaign to immunize the nation’s children against polio following some recent outbreaks. The first case of polio was detected on February 6, 2014 in the district of Niefang, it was an acute flaccid paralysis diagnosed in a two-year old child who was never vaccinated. On March 19, confirmation was received from laboratories in Atlanta (United States) that it is a case of type I poliovirus. Its sequence has shown that it is related to the poliovirus circulating in the central region of Cameroon for the last six months. This is the first case of wild poliovirus reported in Equatorial Guinea since 1999. The vicinity of this country with ours is a threat for Equatoguineans. The government immediately created a crisis committee to look into solutions to prevent the spread of the disease. Following the World Health Organization (WHO)’s recommendation, the government of Equatorial Guinea has launched informational campaigns to educate citizens about the need to take preventive measures against the disease. On April 21-24, the first phase of the preventive campaign, sponsored by the government of Equatorial Guinea, WHO, UNICEF and others, will treat children ages one to fifteen. A second phase will take place from May 12 to 15 and a third from June 9 to 12, sponsored by the government. Children under five years old will be immunized in these phases. After the three phases are completed, the Ministry expects to have all children vaccinated. This strategy, which was also recommended by the WHO, has already produced good results in the Democratic Republic of Congo, Chad and Angola. The Ministry of Health, led by Diosdado Vicente Nsue Milang, is overseeing the campaign. Cameroon, the country most affected with three cases of wild poliovirus since the beginning of 2014 and seven since last year, has reported that it will begin the campaign on April 11. The Ministry also requested the appropriate technical support to implement the campaign, which will be provided by six technical experts from the WHO and a team from the CDC. The United Nations agencies accredited to Equatorial Guinea praised the government for its prompt reaction to the outbreak and its commitment to prevent further infections. The agencies also provided the organizational support to the campaign. The crisis committee, which was formed to search for immediate solutions to prevent the spread of polio infection in Equatorial Guinea, included the Ministry of Health and Social Welfare; Ministry of Education and Science; Ministry of Social Affairs and Gender Equality; Ministry of Transportation, Technology, Postal Affairs and Telecommunications; Ministry of Internal Affairs and Local Corporations; Ministry of Defense and National Security; Ministry of Information, Press and Radio; the World Health Organization (WHO) and the United Nations Fund for Children (UNICEF). The academic partnership between the National University of Equatorial Guinea (UNGE) and Drexel University began in 1999 with a few initiatives such as training UNGE professors and providing UNGE with its initial Internet connection to its current well-integrated collaboration. As UNGE and Drexel University continue to work together, Dr. Hearn believes that UNGE has the opportunity to become a regional leader in researching and protecting one of the most biologically diverse parts of the world. As Dr. Hearn’s time with BBPP comes to an end, Dr. Katy Gonder, a tenured associate professor who is newly recruited to Drexel University, will take over the director position and continue many of the BBPP programs that have already proven to be successful. She will also bring new vigor to the UNGE/Drexel partnership with international collaborations through the Central African Biodiversity Alliance (“CABAlliance”), an organization that she helped to establish. UNGE recently honored Dr. Gail Hearn for her dedication to the conservation and management of biodiversity on the Island of Bioko. 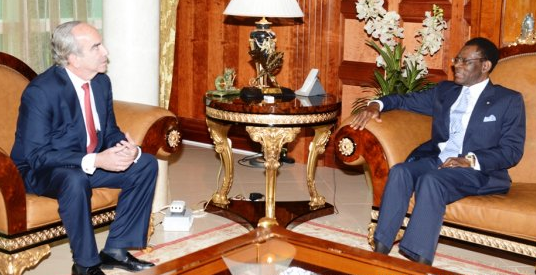 Obiang Nguema Mbasogo, Equatorial Guinea’s President, met with John Barnett Hess, Hess Corporation CEO, to strengthen the long-term and growing partnership between the company and the West African Nation. During the meeting, President Obiang and Mr. Hess discussed the company’s continued investment in the country’s energy, education and science sectors. Hess representatives praised the socio-economic development the country is experiencing. Gabriel Mbega Obiang Lima, Equatorial Guinea’s Minister of Mines, Industry and Energy, Gregory P. Hill, Hess Corporation President and COO of Exploration and Production, Brian David, International Vice President were also present at the meeting. “Hess is an exemplary company that has been working and collaborating in the development of Equatorial Guinea for years, and that has professionally trained many Equatoguineans,” said Minister Mbega Obiang Lima at a press conference. He also alluded to the educational and social contribution the company has made to the country. Hess sponsors projects such as the National Program for Educational Development of Equatorial Guinea (PRODEGE), whose second phase was just approved, in collaboration with the Ministry of Education and Science, which will train students at the primary and secondary level. Minister Mbega Obiang Lima expressed the desire of Equatorial Guinea and Hess Corporation to collaborate on exploitation of the oil fields of Okume and Ceiba, where both expatriate professionals and Equatoguineans work, and on long-term production and extended investment to other sectors. 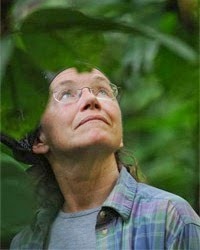 The National University of Equatorial Guinea (UNGE) recently honored Dr. Gail Hearn, Professor and Director of the Bioko Biodiversity Protection Program at Drexel University, with a gold medal for her dedication to the conservation and management of biodiversity on the Island of Bioko. During the award ceremony earlier this year, Carlos Nze Nsuga, UNGE Rector, praised Dr. Hearn’s work in leading Bioko Island’s biodiversity protection program. Dr. Hearn has worked with UNGE since 1997. “Dr. Hearn has directed the program that has allowed the biodiversity of Equatorial Guinea to be known worldwide. Thanks to her, we have conducted research and have found four new species of frogs and butterflies, amongst others,” said Rector Nze Nsuga. Dr. Hearn started her journey toward the conservation of biodiversity on the island at Arcadia University in Glenside, Pennsylvania. She founded the Bioko Biodiversity Protection Program in partnership with UNGE, aimed at promoting the conservation of Bioko Island’s wildlife through self-sustaining programs in education, research and conservation. “We are very proud of all the work the people and the government of Equatorial Guinea have done in recent years, and we have high hopes that within a very few years no more primates in Bioko will be endangered,” said Dr. Hearn. The educational and conservation efforts of the Bioko Biodiversity Protection Program have expanded considerable since 1986. UNGE and Drexel University's Study Abroad Office lead programs during spring and fall semesters. During her time on Bioko Island, Dr. Hearn’s research has focused on the population decline of primate species on the island due to bushmeat hunting, the island’s biogeography, wildlife, monkeys, conservation challenges, and marine turtles to name a few. Mark Asquino, U.S. Ambassador to the Republic of Equatorial Guinea joined Dr. Hearn at the award ceremony. Equatorial Guinea’s President, Obiang Nguema Mbasogo, attended the fourth EU-African Summit held in Brussels on April 3-4. Obiang joined more than 60 leaders from the European Union and Africa in a two-day summit aimed at strengthening security, commerce and migration control ties. The summit discussed security issues affecting the African continent. Attendees focused on the crisis in the Central African Republic and the situations in the Democratic Republic of Congo, Mali, Sudan and Somalia, which have serious problems of instability and violence. President Obiang met with Antonio Tajani, Vice President of the European Commission and Commissioner for Industry and Entrepreneurship, to discuss the promotion of foreign investment in Equatorial Guinea and broader African-European industrial relations. He also held bilateral meetings with business representatives from Belgium, Luxembourg and other European states. While in Brussels, President Obiang gave a lecture at the Cervantes Institute, the public institution created by Spain in 1991 to promote and teach the Spanish language and the other official languages ​​of Spain and to disseminate Spanish and Latin American culture, where he spoke on the role of the Spanish language in Africa. During his address, the Head of State emphasized Equatorial Guinea’s commitment to the preservation of the Spanish language within the international community. Obiang has ensured that Spanish was adopted as a working language within the African Union, the Economic Community of Central African States (ECCAS) and the Gulf of Guinea Commission. The summit concluded with a three-year plan to frame EU-African relations for 2014-2017, which includes 5 topics, peace and security, democracy, good governance and human rights, human development, sustainable and inclusive development and growth and continental integration, global and emerging issues. Earlier this week, President Obiang accompanied by the First Lady, Constancia Mangue de Obiang, traveled to Spain to attend the memorial service for the former Spanish President Adolfo Suarez. Obiang was the only Head of State, Besides King Juan Carlos, present at the funeral. Equatorial Guinea will host a summit for the CFA franc countries as well as members of the International Monetary Fund and the World Bank, which will take place in the Sipopo Conference Center of the capital city of Malabo from April 2 - 3. Marcelino Owono Edu, the Minister of Finance and Budget of Equatorial Guinea, announced the upcoming summit during a meeting, stating that the summit was designed to analyze the overall economic situation of these countries. In preparation of the summit, Marcelino Owono Edu held a preliminary meeting on March 30 to discuss the organization of the Meeting of Ministers of Finance of the Franc Zone. Alongside other members of the Government, the Minister of Finance and Budget worked to design a program that encourages cooperation among the central banks of the Central Franc Zone and economic growth of member countries. Equatorial Guinea is working to play a greater role in the international community, and it is using events such as this summit as opportunities to showcase leadership and promote economic development within the region.